You have found the best Bounce House, Pony, and Party Rentals Whispering Pines, NC has to offer! We have a great selection of party rentals to serve any kind of event that you may be planning. Carolina Fun Factory can proudly boast that we are inspected, and insured, and trained to the highest standards in our industry to make sure that your event runs safely and smoothly. Carolina Fun Factory offers the most unique entertainment rental options for your event. You can enter your event date and times... Our menu of rental items allows you to choose everything from 9 holes of portable mini-golf to an entire carousel of live ponies for pony rides at your event. If you are looking for a bounce house rental for a birthday party, or an array of carnival games such as Human Whack A Mole, or a giant slide rental and mechanical rides such as a trackless train rental for your upcoming church, school or community event, then you will want to work with a company with a proven track record of success. Your success is our success! Many of your neighbors have trusted us to provide unique rentals for different themed events. One of our most popular categories is Unicorn rentals! Bring your guests dreams to life with real live unicorn rentals such as Frosty the Unicorn. 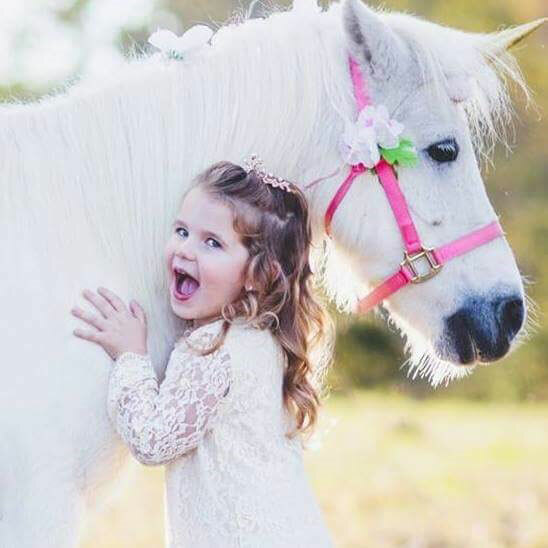 This adorable little pony has been featured all over the central North Carolina area, including Whispering Pines, as the subject of many photo sessions and birthday parties. Frosty the Unicorn is the perfect centerpiece for your unicorn themed party or photo shoot. He is a small pony which makes him a favorite among smaller riders of no more than fifty pounds. The magic continues with other unicorn themed offerings such as our unique Unicorn Bounce House rental. Carolina Fun Factory is proud to be the only company in central North Carolina with this unique inflatable rental. This bounce house rental is more than just a jumper with a unicorn banner on the front...this fabulous combo unit features a full sized 3-D unicorn and additional unicorn accents which makes it scream UNICORN! Your choices continue with this unit to have it as either a dry rental (that means it has a soft landing pad at the end of the slide) or you can rent it as a wet rental (that means riders rush down the slide to a cool pool of water at the bottom). That's not all we have for you to go along with your unicorn party rentals...you'll also find Unicorn Glitter Tattoos which are professionally applied by our artists at your party and makes a great party favor as they are long lasting...up to a week and even water proof! Team building is an important component of the success of any group. When you bring your team together to overcome challenges outside of the workplace or classroom, you usually will see a more positive energy transpire among the group. Team building activities that involve relay type of games are the best! For this you may want to consider a rock climbing wall rental at your location or an array of obstacle course rentals that are sure to add a fun, challenging element to your team building event. 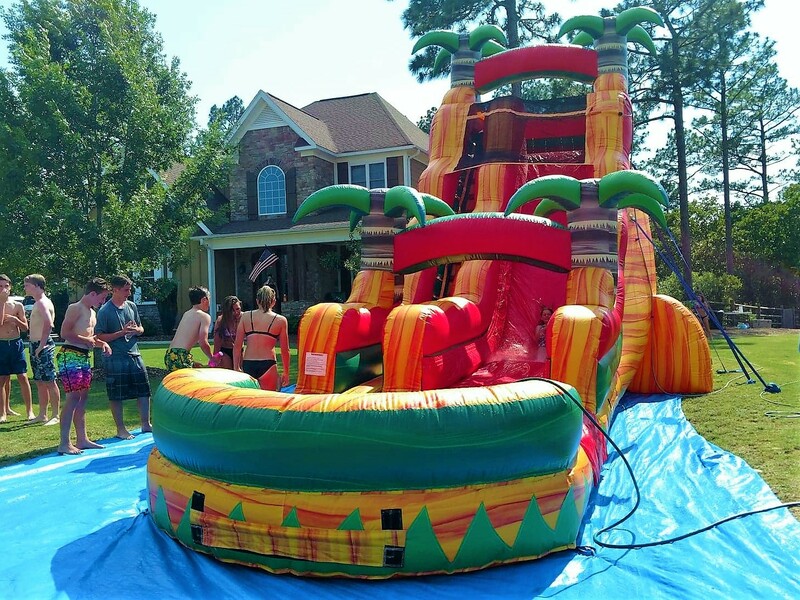 Carolina Fun Factory has the best water slide rental Whispering Pines, NC has ever seen! Don’t get stuck indoors during the hot summer months when you can book one of our super fun combo bounce house with a water slide and a pool built right in! Are you a local Whispering Pines, NC business? Whether you want to celebrate opening day, gain more attention and increase sales, show customer appreciation, or throw a business party for your employees, our party rentals will delight everyone in attendance! Carolina Fun Factory also provides tent, table and chair rentals for your special day. Don't get caught with not enough places for people to sit in the shade and enjoy the concessions with these important rental equipment items. Carolina Fun Factory is committed to providing our customers with the best customer service in Whispering Pines, North Carolina. We know how important your event is to both you and your guests and we will treat it with as much care and attention to detail because it's OUR event too once you've entrusted us to be a part of it. We offer consultation with you over the phone and ask important questions to get to know your event needs. We will gladly make suggestions regarding the set up to insure the best traffic flow for your guests. Whether you're planning a backyard party, or a large corporate event, we understand that the details is what makes any event operate smoothly. We even offer a site-check consultation for a nominal fee to insure that everything that you are planning at your location will work according to your expectations.